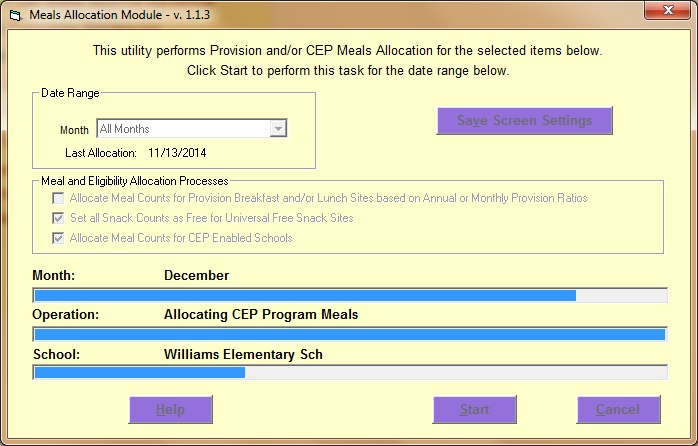 This Add-On Module for FUNDamentals allocates Provision or Community Eligibility Provision (CEP) meals based on claiming ratios and/or Universal Free Snacks. Claiming ratios for Provision meals are set in the Provision Module. Claiming ratios for CEP sites and the Universal Free Snacks option are set right in the NFSMI FUNDamentals/MyFUNDamentals Schools List or School Information screen. Select a month or accept the All Months default. The module will use the total monthly meal counts recorded for each meal program (Breakfast, Lunch, or Snack) multiplied by the Provision Claiming ratios or the CEP free claiming ratio for Provision or CEP sites accordingly. Provision ratios are established using the Provision Module. CEP free claiming ratios are established under the Site Setup menu in the FUNDamentals software. Select the Meals Allocation operations you want to perform by placing a checkmark in the appropriate checkbox. Available options will depend on the current program and site setup in your district. Click the Start button to perform the meal allocation operations or click Cancel to close the screen.